Mr. Ben Hurt was the principal of Albemarle High School for 30 years (1954 through 1984) and more than 10,000 students graduated from Albemarle during that time. More than 30 years since his retirement, he still attends our class reunions and he still remembers every one of those student's names! Pat Conroy, one of America's most noted authors, ("The Great Santini", "Prince of Tides", etc.) described his high school English teacher as follows - and the words apply so aptly to Mr. Hurt. dwelled in the shadow of his almost unnoticeable greatness." 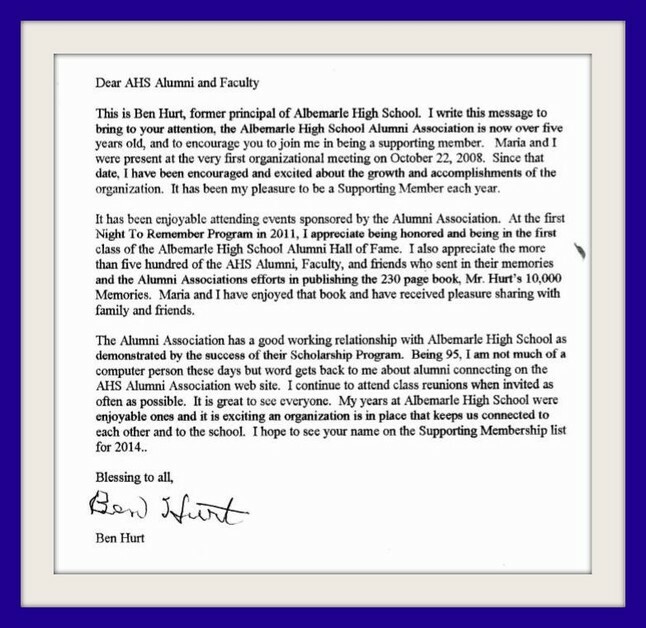 Mr. Hurt has been one of the greatest supporters for the AHS Alumni Association since our beginning in the Fall of 2008 and, in the letter below, he asks for your support of the Alumni Association. Please join him by as a Supporting Member for 2014. You can learn more and make an easy online payment on the Supporting Membership page. .